Sigh. I don't get enough days out in the woods, but did manage to score all these within a ten minute local jaunt. Today brought us no mushrooms, but we did meet some beekeepers who also love the funghi -- a promising contact for bee questions. I'm hoping to start some hives this spring. Did some real canning this year, a hobby that has been on hold while having small children. I always shoot for as many quarts of tomatoes as possible. I think I got somewhere around 17, not nearly enough. Varietal chile salsas were a first for me. I worked without a recipe and they turned out great. I fire roasted red jalapenos, as well as a red Padrons, added some vinegar and garlic -- heavenly, or maybe it's hellish. Since my husband likes the hot stuff, I also made a fermented chile pickle with ground mustard seed, cayenne, and ginger from this Madhur Jaffrey's book. This pickle inspires me to want to make more fermented foods. My friends over at Mariquita Farm are downsizing their livestock and we may be the proud new owners of seven ewes and a ram soon, like this week! over at Mariquita during my two hours a week of kid-free time. It's close to preschool and Julia and I like to cook, talk, and get some farm chores done together. We did pumpkins into puree and roasted peppers over an outdoor fire. Omnivore's Dilemma. It puts all my feelings about food and agriculture into words. I know I'm late reading it, but for all the other stragglers out there, Go Forth and Read! 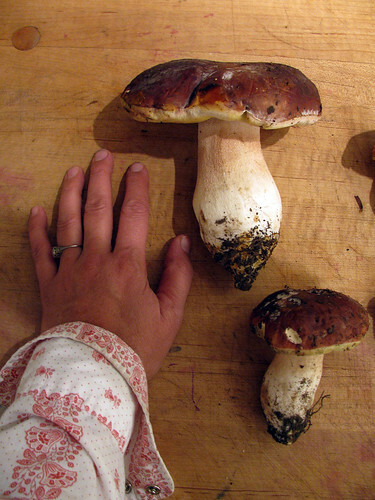 Yum- those are beautiful boletes! We found some a few weeks ago as well as some lobsters for the first time ever. I hope you get your sheep and thanks for the great links. sheep! bees! I can't wait to find out how it's all done! a friend & I canned about 18 pints of slightly-modified nigella lawson mushroom stroganoff on wednesday (google) & while I can look at the jars and wretch (looks nasty!) I can not only inhale the stuff but also feed it my kids (it's that good) so I am with you, totally down with an el nino fungus fest in the mountains! ooooh sheep! You're going to have one happy dog! that is one giant mushroom! Holy smokes those are some mighty mushrooms. I keep having to stare at them. Omnivore's Dilemma is the next book on my reading list. I can't wait to pick it up. My uncle used to have bees. I miss the honeycomb he would send us every year. Wow, nice bolete. Just discovered your blog... good stuff! Oh awesome fungi! So nice to see you back on the blog...Miss running into you here and there. Hope all is well. You have a beautiful blog and I am enjoying reading it! I got a lot of canning done myself this year and love to spend time gardening, harvesting and then canning my goodies.